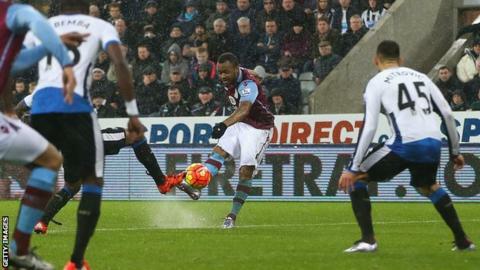 Jordan Ayew's superb second-half goal earned Premier League bottom club Aston Villa a point at Newcastle. Ayew drove into the top corner from inside the area to cancel out Fabricio Coloccini's close-range opener. Both sides had chances to win in the closing stages, with Newcastle striker Georginio Wijnaldum and Villa's Rudy Gestede having shots saved. Villa, without a Premier League win since the opening game of the season, remain 10 points from safety. Until recently, Newcastle boss Steve McCLaren had looked in danger of losing his job after failing oversee a win any of his first eight Premier League games. However, back-to-back victories against Liverpool and Tottenham lifted Newcastle out of the relegation zone and three points on Saturday would have moved them five points clear of danger. Key to Newcastle's upturn in form has been a switch to a more counterattacking style of football, but a sodden pitch, coupled with Aston Villa's defensive approach, meant was ineffective against Aston Villa. They struggled to break Villa down for long periods, with their opener coming from a defensive lapse in concentration from a corner, as Coloccini was left unmarked. However, when Villa pushed forward after equalising, it played to Newcastle's strengths and they twice went close to snatching victory on the break, with Wijnaldum's and Ayoze Perez's finishing letting them down. Newcastle remain one place above the relegation zone, but the draw means they are three points clear of Swansea in 18th. No Premier League team with as few points as Aston Villa at this stage of the season have stayed up, and they would certainly need an impressive upturn in form to rescue their situation. Villa have kept just two clean sheets in their 17 league games this season and the ease with which Newcastle scored, with Siem De Jong's corner cutting through the defence, will be of concern for manager Remi Garde. However, their second half performance will give the Frenchman some hope. In Ayew, they have a striker who is finding his form in the Premier League. He had gone seven games without scoring at the start of the season but, having been employed in a more central role recently, he has scored four goals in his last eight games. Newcastle head coach Steve McClaren: "The conditions were horrendous. Get the ball wide and get the ball in the box - it was a game for width. "Anybody can beat anybody in the league. I said before the match this was a dangerous game. Regarding us, a settled side has helped the momentum. We might not win every game but we've made huge steps forward." Aston Villa manager Remi Garde: "We didn't play well at all in the first 45 minutes. We were out of the game in terms of impact and intensity. If you are in the position we are in it's difficult for the player to get in the game straight away. "There's a lack of confidence. It's better to react late then not to react. The fact we got back in the game could be very important. Newcastle have won the last two games, but in the second half we showed we are not far away from this type of team." Fabricio Coloccini scored his first Premier League goal since November 2014 and his first at St James' Park since January 2011 against Spurs. Newcastle have dropped 12 points from winning positions in the Premier League this season; more than any other side. Newcastle are unbeaten in three Premier League games (W2 D1) - the first time they've managed to go three league games without defeat since February 2015 (W1 D2). Aston Villa will be bottom of the Premier League at Xmas - just three of the previous 23 teams to be bottom of the competition on Christmas Day have stayed up. However, the team that were bottom of the Premier League on Xmas Day in each of the last two seasons have managed to avoid relegation that campaign (Leicester 2014-15 and Sunderland in 2013-14). Newcastle host Everton on Boxing Day while Aston Villa host West Ham on the same day. Match ends, Newcastle United 1, Aston Villa 1. Second Half ends, Newcastle United 1, Aston Villa 1. Attempt missed. Carlos Sánchez (Aston Villa) right footed shot from outside the box is high and wide to the right. Assisted by Leandro Bacuna. Ashley Westwood (Aston Villa) wins a free kick on the right wing. Foul by Florian Thauvin (Newcastle United). Attempt missed. Ayoze Pérez (Newcastle United) right footed shot from the centre of the box is too high. Assisted by Moussa Sissoko. Corner, Aston Villa. Conceded by Robert Elliot. Attempt saved. Rudy Gestede (Aston Villa) header from the centre of the box is saved in the top centre of the goal. Assisted by Jordan Veretout with a cross. Corner, Aston Villa. Conceded by Daryl Janmaat. Ashley Westwood (Aston Villa) is shown the yellow card. (Newcastle United) wins a free kick on the left wing. Attempt missed. Aleksandar Mitrovic (Newcastle United) header from the centre of the box misses to the right. Assisted by Ayoze Pérez with a cross following a corner. Corner, Newcastle United. Conceded by Rudy Gestede. Foul by Carlos Sánchez (Aston Villa). Ayoze Pérez (Newcastle United) wins a free kick in the attacking half. Jordan Ayew (Aston Villa) is shown the yellow card. Leandro Bacuna (Aston Villa) is shown the yellow card for a bad foul. Foul by Leandro Bacuna (Aston Villa). Corner, Aston Villa. Conceded by Aleksandar Mitrovic. Alan Hutton (Aston Villa) wins a free kick in the attacking half. Foul by Rudy Gestede (Aston Villa). Chancel Mbemba (Newcastle United) wins a free kick in the defensive half. Attempt saved. Georginio Wijnaldum (Newcastle United) right footed shot from the centre of the box is saved in the centre of the goal. Assisted by Ayoze Pérez with a cross. Robert Elliot (Newcastle United) wins a free kick in the defensive half. Substitution, Newcastle United. Florian Thauvin replaces Vurnon Anita. Corner, Aston Villa. Conceded by Fabricio Coloccini. Attempt saved. Carlos Sánchez (Aston Villa) right footed shot from outside the box is saved in the top centre of the goal. Goal! Newcastle United 1, Aston Villa 1. Jordan Ayew (Aston Villa) right footed shot from the left side of the box to the top right corner. Assisted by Jordan Veretout with a cross following a corner. Corner, Aston Villa. Conceded by Moussa Sissoko. Attempt saved. Rudy Gestede (Aston Villa) header from the centre of the box is saved in the top centre of the goal. Assisted by Alan Hutton with a cross. Substitution, Aston Villa. Rudy Gestede replaces Scott Sinclair. Substitution, Newcastle United. Ayoze Pérez replaces Siem de Jong. Jores Okore (Aston Villa) wins a free kick in the defensive half. Foul by Aleksandar Mitrovic (Newcastle United). Attempt missed. Siem de Jong (Newcastle United) header from the right side of the six yard box is close, but misses to the right. Assisted by Georginio Wijnaldum with a cross.